Phanteks presents the PH-TC14PE, a new processor cooler with five 8mm thick heatpipes, two heatsinks and two 140mm fans. The cooler will arrive by the end of the month, the standard color edition will cost 79.90EUR (incl. VAT) while blue, red and orange editions will be available for 5EUR more. Phanteks coolers are designed with patented Cold Plasma Spraying Coating Technology (C.P.S.C), a brand new technologic forming deposit that displaces heat onto corresponding metals at a quicker rate. With this technology, Phanteks coolers enhances thermal conductivity on the soldered surfaces of the heatpipes through the copper deposits. For reliable and maximum overclocking, Phanteks offers enthusiasts PH-TC14PE (Premium Edition) , which includes Phanteks patented Physical Antioxidant Thermal Shield (P.A.T.S) technology. It will highly increase the coolers cooling performance and reliability while reflecting other thermal radiation. The heat is being dissipated faster, which leads to more overclocking room for enthusiasts. This technique has already been proven by the aviation industry and is now applied within the PC industry. With five nickel-plated 8mm copper heatpipes in the u-shape design. 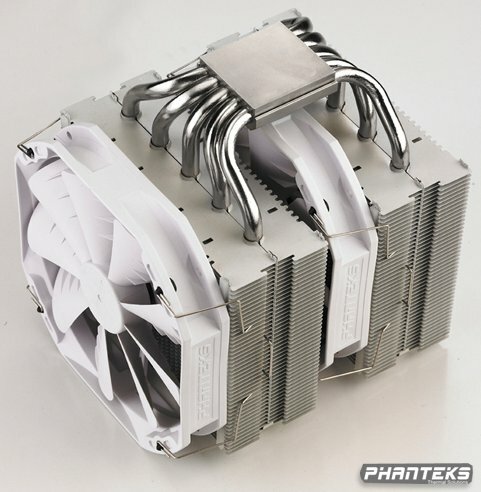 The heatsink is built for a push-pull configuration for maximum cooling performance. Both models are fitted with two 140mm of Phanteks PH-F140TS Premium Fans for effective airflow (third fan is optional). Provided with the SoliSku mounting kit for easy-to-install retention mechanism of universal back plate for Intel LGA1366, LGA1156, LGA1155, LGA775 and AMD AM2/AM2+/AM3, designed to protect and prevent the motherboard from bending, normally caused by the heatsink. Topped off with the superb PH-NDC nano diamond thermal compound, made of high-purity nano diamond particles to improve the thermal conductance between the CPU and the heatsink.